The theme has finally been updated ! Well, in case you didn't notice. 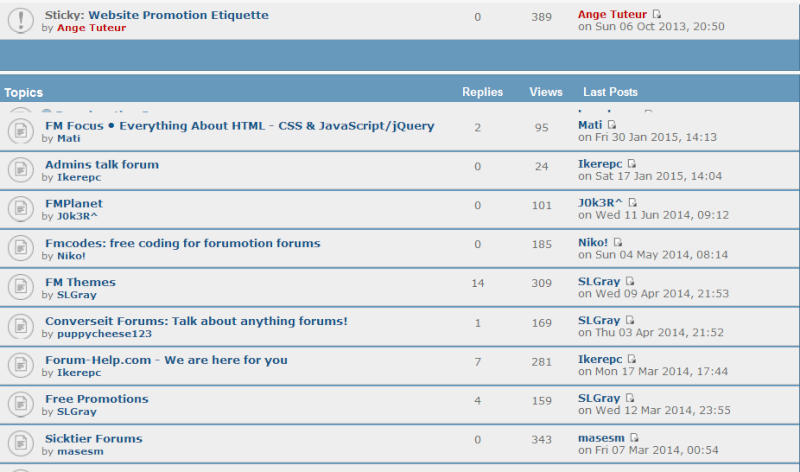 I've finally updated the forum theme to the one I said I've been working on for weeks. 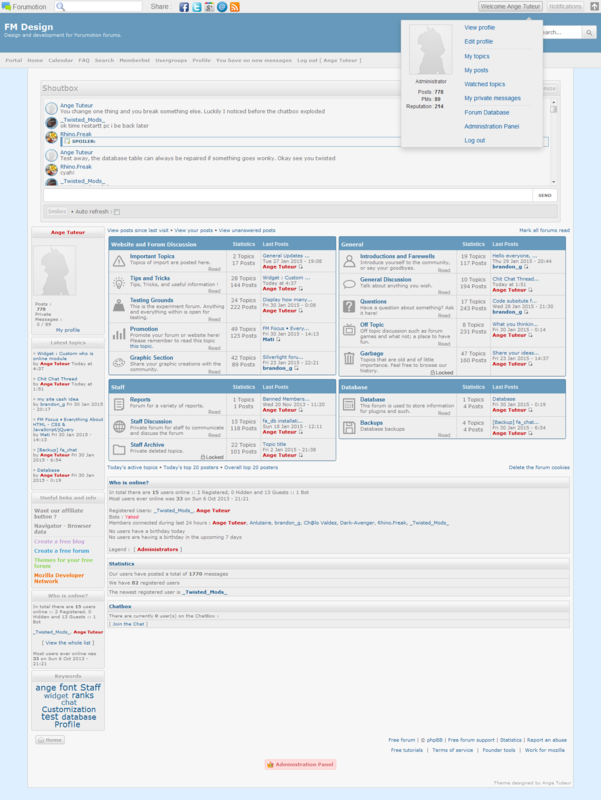 It is similar to the old theme, but includes a fresher palette of... pale colors, and a new set of images. I'm sure if you look around you'll see some other small details such as the friends and foes management.. or the toolbar, but that's like in your face. Anyhow, I'll be releasing the theme on hitskin after a few days of testing here to make sure there are no bugs. After that, I'll focus my efforts one designing a dark variant of the theme. If you notice anything wonky or want to share your thoughts on it, feel free to let me know. Thanks, and enjoy the new theme. Re: The theme has finally been updated ! I am using IE browser, it may just be my end or it may not even be a glitch I am not sure, I am just reporting the possibility of it being one. @brandon_g thanks for reporting that. It was problem with CSS positioning in IE7. When the adverts were injected into the page, the CSS positioned elements retained their current position, whereas the other elements moved down the page without problem. I've made some modifications to remove the positioning from those elements, let me know if everything looks okay for you. Not a problem Ange and yeah the problem is not happening anymore and is fixed. Theme looks good too, I notice that when you change sections or topics it looks as if the has not even changed yet the new topic is right in front of me. Nice going with the new theme Ange. Ange I think I may have another glitch! This one is in the questions section: you can see that the text in the questions archive overlaps with the latest topic.It could just be my end too but I figured I would report it just in case. @brandon_g thanks, I've made the correction ! Luckily it's only specific to this forum since I'm using an inline category style which modifies the width of the children elements. It overflowed when the viewpoint got smaller. Not a problem Ange glad I can help. I guess I am more obeservate then I thought, must be the survivalist in me . 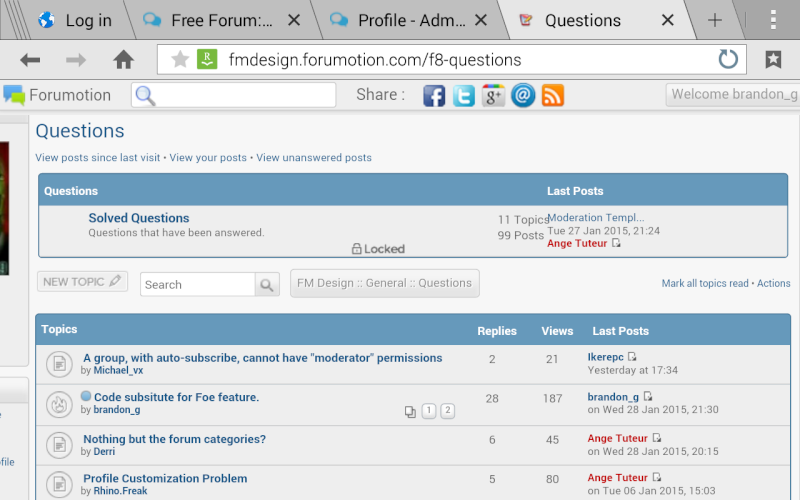 I found another potiential glitch (may be my end), when I read 1particular of mine in this topic on this page: http://fmdesign.forumotion.com/t14p240-count-to-one-million#2591 the user profile info and stuff is pushed to the right. It was erroneous bbcode in this post. I fixed it..
Did you write the bbcode as this ? If so, that'll cause some major display problems. The right tag should be either inside the updown or outside. If it's inside AND outside it'll make everything go boom. Make sure your tags are placed correctly to avoid errors. Ah ok thanks for letting me know this, I never though it mattered, I will take that into account from now on .